I saw this cool Twilight keyring/bagclip last week on Amazon and couldn’t believe that it was more than $40! After investigating for awhile, I found that it was only one seller on Amazon that was selling it for that. If you buy it directly from Amazon, you can get it for only $6.99. This particular keychain is called the Twilight Lion and Lamp. 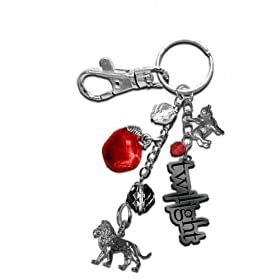 It has charms including a lion, a lamb, an apple, and the Twilight movie logo. The only down side is that by ordering it at the cheaper rate, it will not ship for 4 to 7 weeks. 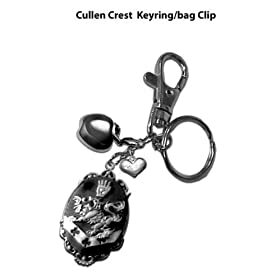 I don’t like it as much, but they also have a Twilight Cullen Crest Keyring/Bagclip. You can order the Twilight Cullen Crest keychain from Amazon for $9.99 and it will ship between 4 and 7 weeks. If you want to pay a much higher price, you can order it from one of their resellers and have it delivered sooner. It’s worth noting that these Twilight keychains are made by the same company that is making the official Twilight Cullen replica jewelry. I love this Twilight stuff, its awesome. I have the “Stupid Lamb, Sick Masochistic Lion” keychain! its sooo cool!